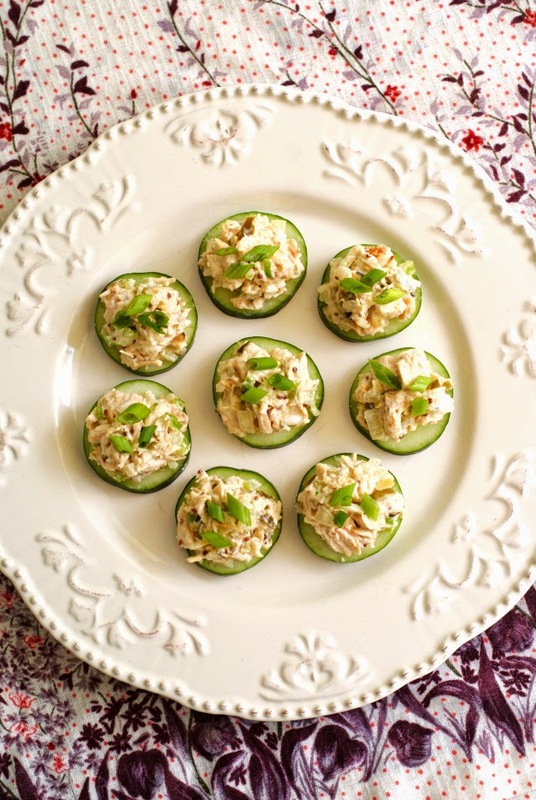 Chicken Salad Cucumber Rounds are healthy little bites that are perfect for lunch, a bridal shower, a baby shower, Mother's Day Brunch, or a simple snack! Every time I am baking or grilling chicken, I always make sure to make a little extra so that I can make chicken salad with the leftovers. Once up upon a time, I didn't eat chicken salad because I was anti-mayo. I'm still not a huge fan of mayo on its own, but I've come to realize that it's pretty great in lots of recipes. As far as chicken salad goes, I like mine pretty basic. I'm not really into the addition of nuts. I don't like my chicken salad super duper crunchy. And I'm not a huge fan of sweet additions either. I've seen lots of recipes that add grapes or cranberries. Yeah, no thanks. I make my chicken salad super simple with leftover cubed chicken, mayo, mustard, celery, onion, and relish. The relish is key, though. I always use dill relish, not sweet. Again with the sweets in my chicken salad...no thanks. 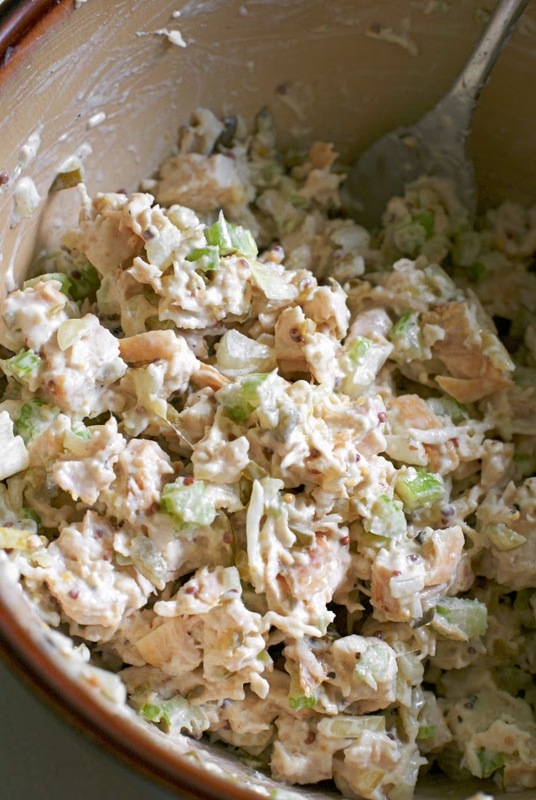 The dill relish gives the chicken salad a little salty vinegary kick that I love. I've been trying to eat healthier, which seems to be the norm for me every Spring. I shudder at the thought of squeezing myself into a bathing suit, so I'm cutting down on the carbs, eating less cheese, and upping my water. 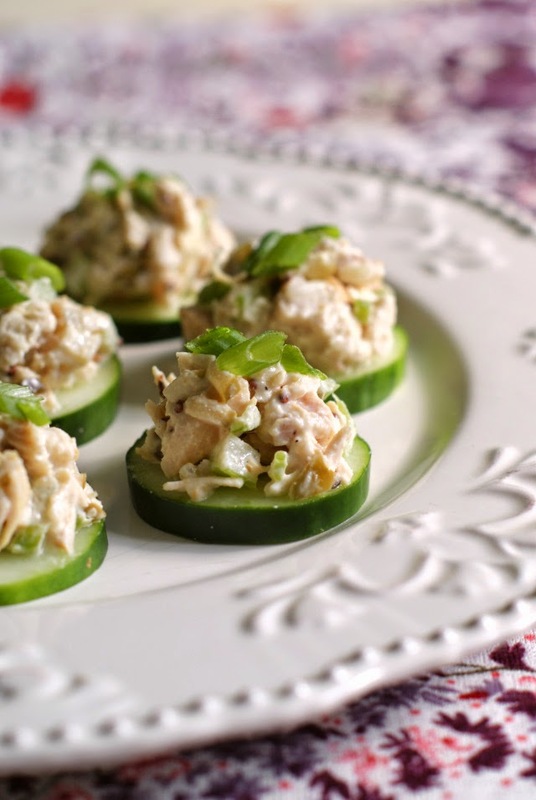 The great thing about this recipe is the fact that it uses cucumbers as the vehicle for the chicken salad, which is a much healthier option than a couple of slices of bread. If you're already bikini-ready, then by all means, break out the bread! I'm sticking with the cucumbers for the time being, though. Another great thing about this recipe is that you can prep these little bites a day ahead of time if you're making them for a party or brunch, If you slice the cucumbers thick enough, they hold up really well for a day in the fridge. You can serve them of a pretty plate for a bridal or baby shower like pictured above, or break out the fun and bold plates for a barbecue or game day spread, like pictured below. Either way, these tasty little round are perfect for so many occasions! They are healthy, you can make them ahead of time, and they are pretty as a picture! 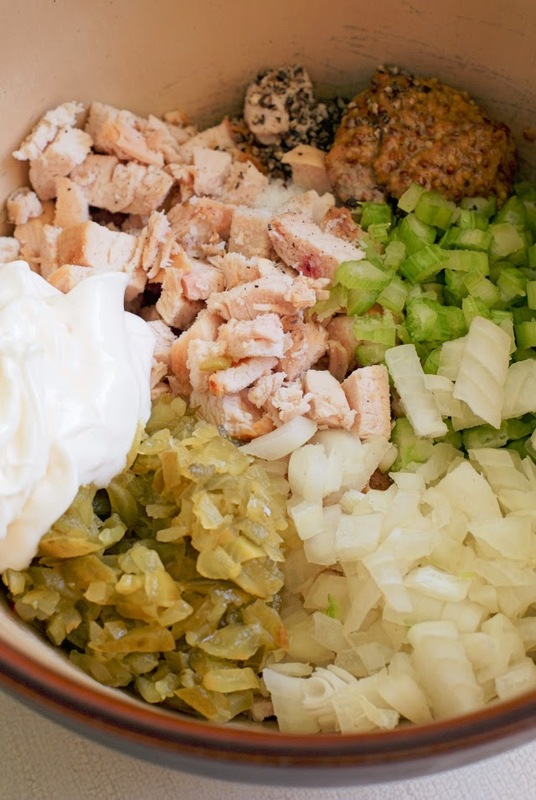 In a bowl, combine the chicken, celery, onions, relish, mayo, and mustard. Using a fork, mix all of the ingredients, really pressing down on the chicken so that it shreds a bit. Season with salt and pepper, to taste. 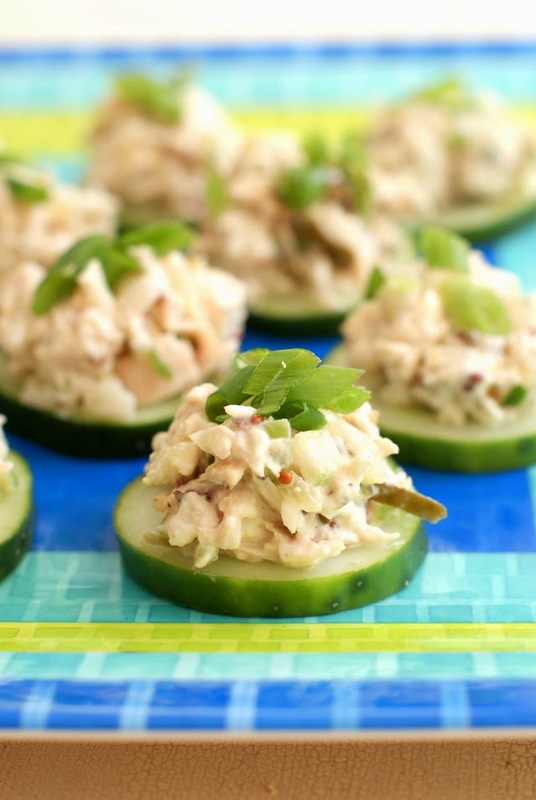 Top each cucumber round with a spoonful of chicken salad and garnish with green onions. Sometimes you can omit mayonnaise and use yogurt instead. I'm on the blood thinner called Coumadin(Warfarin), and have to watch out for too much mayonnaise in my diet, and yogurt is healthier and has a nice tang. I love substituting yogurt for mayo. I do it all the time!